A Bowhunter's Heaven | Our Unending Honeymoon! THREE … HEY! SOMEBODY PAID MY BILL! FOUR … I’LL DO IT MY WAY, THANK YOU! FIVE … THE BLOOD TRAIL. This booklet contains five short chapters and takes about 45 minutes to read. You may read it at one sitting or you may choose to study it one chapter each night for five nights. Either way, it contains detailed instructions on how to find the greatest trophy of all time. Old Buck Mulie lowered his head in defiance, weaved a little, like a drunk ready to fight, then charged. Shreds of velvet dangled from the needle points of those big, beautiful antlers. WHOA! No time to think about horns right now though. Git outa the way! This time he almost “nailed me to the barn” on those long wicked spikes of his. What a predicament. Here I was between the oak-brush and the aspens, in the middle of a large sagebrush hillside, way up on Colorado’s Ungcomphagre plateau. I was in this guy’s living room, and HE … WAS … MAD! One week earlier, on Saturday, opening day of the 1977 Colorado archery season, I had stalked this same deer as he lay at the edge of the oak-brush on the ridge above me. But because of a miss — my arrow had sailed about six inches over his back and glanced off his antlers — all I got to see that day was his rump and those big horns bouncing down his escape route like a runaway boulder. But that was then. Let’s get back to now. My hunting buddy, Glen, had just spooked Buck out of his bed up on the ridge, and that same deer was now making his getaway this second Saturday in a row, down the same escape route. Only today I was standing right in his way! When Buck exploded from the oaks not thirty feet away we scared each other so bad he almost fell down turning left while I, the expert marksman and bowhunter (swagger), stood there like a statue with my Howard Hill longbow at full draw. No smooth, quick release? Hey … I couldn’t even let go of the string. I froze! A few seconds later I did manage one shot as the mulie bounded down the hill to my right, but because I misjudged, AGAIN … my arrow sailed just inches over his shoulder, AGAIN! This time, though, the Howard Hill broadhead smacked him at the base of that near perfect 24″ by 24″ rack. Buck somersaulted forward, piling up in a heap, as the points of his antlers dug into the dirt. Obviously a rare, instant kill. Buck must have felt it was either me or him out there in the middle of that open hillside … and he was right. He charged me three times during that 90 second bull fight, but lost his balance and fell onto his right side at the last second each time. I was finally able to end it all, but even today, more than twenty years later, I can recall every detail of that few minutes as though it was a Technicolor instant replay in my head. Because of a bad shot — actually, a miss by any good standard — I caused both Buck and me what seemed like an eternity of unnecessary misery. When I consider all the years I’ve called myself an archer, whether shooting at hay bales for practice, or hunting the fields and forest, I’ve discovered one grand truth. When you miss the mark you aimed at, you’re only “Doin’ a what comes na-chur-ly.” And, you know, in the same way, missing God’s mark of perfection in our life is no different than missing a bull’s eye on a target. Every single human being is saddled with this spiritual problem, archer or not. First, let me ask you a straight, honest question — maybe the most important question of your life. If you were to die today, this very day, do you know for sure you’d go to Heaven? O.K., now wait a minute … none of the jokes. And please don’t shrug this question off as stupid. It’s a shame most people have to die FIRST before they find out just how important this subject really WAS! A long time ago a friend showed me an interesting verse in the Bible. Being an archer, it had special meaning for me. “For all have sinned and fall short of the glory of God.”1 I’m told that in the original Greek language of the New Testament the word “sinned,” in this particular verse, meant to shoot an arrow at a mark or bull’s eye AND PLUMB MISS! Think back with me to he Greek games. Those were the original Olympics, only without politics. The archery competition is beginning. The bowmen, standing at the line, study the target — a slender rod about five feet tall, almost two hundred yards away. The second archer steps forward, bends his bow and quickly sends his shaft on its way. The crowd again echoes it’s chant as his arrow falls eight or ten yards short and skids along in the dirt, kicking up a trail of dust. And likewise, throughout the hot afternoon, all of the other contestants fail, either missing completely or falling far short on every shot. Murmurs are overheard from several of the better contestants. Then out of the crowd steps one lone bowman. Nothing about him would make us think he has exceptional skill — a man of average build, common in every respect. He strings his bow as he silently surveys the difficulty of the task at hand. He has already observed all of the others fail. He knocks an arrow and with one mighty heave on the string, hurls the shaft through time and space — CRACK! — splitting the stave in two. Silence falls on the crowd. Can he do it again? A new target is stood in place and again his arrow strikes it’s mark squarely. One by one this man shoots his arrows, and one by one each target is hit and splintered. He did not miss once, even by a hair. This man has humbly demonstrated perfection in the archer’s sport. The gold is his. Every one of us who has ever shot a bow or gun, thrown a ball, flipped a marble, or tossed a rock at something has experienced this problem of “missing the mark.” And after many years of practice, even the best would admit they still fall far short of absolute perfection. And if each one of us was completely honest about it, we wouldn’t need to think back very far to remember many times when we’ve missed GOD’S mark — His standard of perfection. Even if we slipped deep into the forest alone and confessed our failures secretly to God, each one of us would have to admit to HIM that we fall far short of HIS “Bulls-eye” for our lives every day. And a lot of the time these spiritual “misses” are because we never even tried to hit God’s mark — didn’t care — or worse yet, BECAUSE WE DELIBERATELY AIMED TO MISS! And you and I both know exactly what I mean by that. STOP THE BOAT RIGHT HERE FOR A MINUTE! Let me point out right here in the beginning … this booklet is NOT about religion. I am NOT trying to “convert” you to any religious system, nor am I trying to get you to “change your ways,” “give up anything,” or start living up to any “religious standard.” All that is between you and God … later. What I am trying to do is show you just how simple God made it for you to be sure you will go to Heaven after this old life comes to an end. Does that sound fair? If so, keep reading, and enjoy the stories. Now, having said that, let’s look back at that Bible verse in Romans again. What does the Bible call the target or mark we all have missed, that standard we have all failed to measure up to? “For all have sinned and fall short of … THE GLORY OF GOD.”2 “The glory of God?” What in the world does that mean to me and you? Let me put it into lingo we can all understand. The Lord Jesus Christ, God’s Son, is the very outward expression of God to mankind. He is, literally, the glory of God in a human body. “The son is the radiance of God’s glory and the exact representation of his being …”3 Jesus is the only “Glory of God” we humans can know and relate to. And this “Glory,” this standard of perfection or bench mark from God, came down here to earth, became a human being, just like you and me, and lived and died right here among us where we could all see and understand it! Plain as that. If you and I have not lived this life in every way like Jesus did — that is, with absolute perfection to God and man in every word, every deed, every thought and every motive … every single shot — then we must admit, we have missed God’s standard, God’s mark. Now, mind you, God will not judge us by the “Thou Shalts” and “Thou Shalt Nots” of the world’s religions, or by the spiritual standards of our friends and neighbors. Hey, He doesn’t even judge us by any secret set of standards we make up for ourselves. No, He has already judged each life by HIS perfect standard, HIS measuring tape — by HIS Son, the Lord Jesus Christ. And remember, we’re not talking about some stranger from another planet, here — someone who didn’t know what it was like to be human. No! We’re talking about Jesus, who stepped up to the same line as all the rest of us and hit the mark dead center … every single time! You see, with a yardstick like Jesus to hold up to our lives, only God in Heaven has the right to measure and judge us — no one else! And this personal God (who is really there watching everything, just like we were told in Sunday school when we were kids) hasn’t made His decision based on just a few little mistakes. No! He sees our entire life from beginning to end … EVERY SINGLE SHOT. And what is His verdict? Mrs. O’Leary’s cow kicked over the lantern, but that was only the beginning of her problems! In the same way, being guilty of missing God’s mark throughout our lifetime would certainly be bad enough on our heavenly record, but the consequences that have developed because of our poor spiritual marksmanship are much more than we can handle. The morning of opening day Joe planned to head up the Thoroughfare to collect some of its famous Yellowstone Cutthroats for lunch. Bob decided to ride along, scouting and hunting that part of the country. Just before the two men rode out, Gary Jenson, a park ranger, stopped by camp for a visit. As the men stood around sipping the last of the coffee, Gary opened a topo map, spread it on a folding table and explained, “Be really careful over on the Thoroughfare, and stay clear of the flagged area across the river toward Wapiti pass … right there.” He put his finger on the spot. 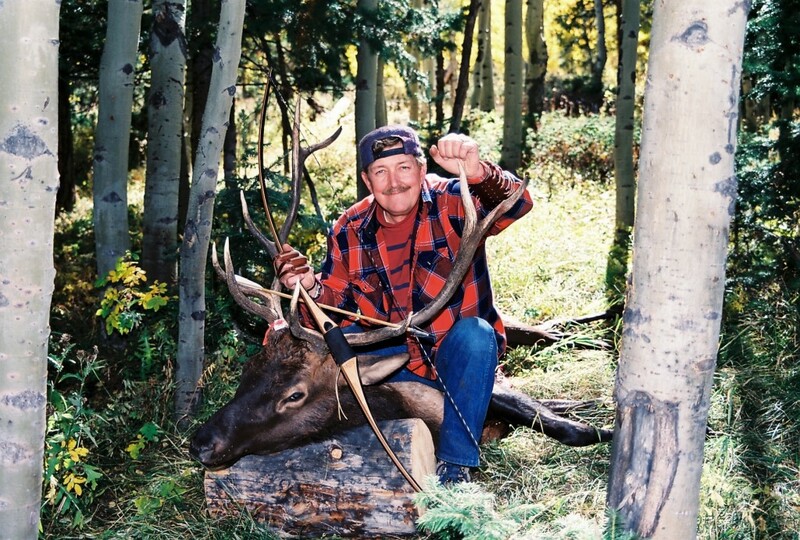 Bob understood the instructions perfectly, but he was dreaming of a trophy bull elk. And it didn’t help any when he and Joe heard the shrill, ringing bugle of a bull in rut, drifting in on the wind from a mile upriver. About 45 minutes up the Thoroughfare from Bridger lake the two men crossed a riffle to a long sandbar. They studied eagle tracks in the wet sand, and were surprised when the big bird swooped down out of a dead fir tree upriver from them. They also saw fresh elk tracks and bear prints — one big bear and two cubs. Joe decided to work his fly rod over the rolling current out from the sandbar, and Bob just wanted to get hunting. “Meet you back here about noon?” Joe asked , but Bob was already headed after the bull. Several hundred yards upriver from the sandbar a branch trail shot off across the flats toward Wapiti pass. A sign warned of dangerous bear in that area, and yellow flagging ribbon was stretched across the entrance to the pass trail, just as Gary Jenson had warned. Bob turned in the saddle and began glassing the slopes toward the pass. Nothing showed at first, then he saw him. The bull was about a five-by, no world’s record, but nice. He was with a dozen cows and a couple yearling spikes, who were keeping a safe distance. Now came the hard decision. Might not see another animal that nice the rest of the season. Should I try to work in close for a kill …? He checked the wind again … That bugger’s already a good half mile inside the closed area and moving those cows away from me. Not much chance of seeing that sow bear around these elk. Yea … and I think that ranger was headin’ up the Yellowstone this morning. Bob pondered his choices for several minutes, then looked back one more time. What he saw this time made the decision for him. The binoculars gave him a beautiful picture of another bull, much bigger than the first, challenging and moving toward the small herd from quite some distance away. Good grief … look at that, a full Royal, probably go three-eighty. That old boy is so worked up he’ll never know I’m around. I’m going to try him. Sooooo … ignoring the warnings, and deliberately choosing to do the wrong thing, Bob headed across the flats toward a narrow slice of timber between him and the elk. He tied his jittery horse to an aspen and started a low, slow stalk. He was keeping hidden from the elk by working his way along the opposite side of a small rise. The bulls were insulting each other real fierce, but the grunts and screams seemed to be getting further away. Fearing the herd bull might break for it and push the cows ahead of him, Bob lost the last of his caution and began to run for a distant vantage point by some heavy downed timber where he thought they might cross. The cool high-country wind was in his face, and the rush of adrenaline made his anticipation skyrocket. He actually shook with excitement. He caught his breath as he slipped around a huge boulder, and was starting to climb over a big dead-fall when a sound to his right made him jerk his head for a glance. He froze to an ice statue as he was brutally dragged back to reality by the warning “woof” of (what looked to him like) a locomotive sized grizz. The sow and her cubs! Standing to face the intruder was 500 pounds of unadulterated, potential rage … with a bear-hair trigger. Momma “woofed” her warning again, then dropped to all four and started bounding toward the bowhunter at a slow, deliberate, check-out-this-intruder pace. She was still in her warning mode, but Bob hadn’t listened to any other warnings given him that morning so the next thing he did was the most foolish mistake of all. Without thinking, he quick drew his 74 pound longbow and threw an arrow at that huge, bobbing head while the bear was still about 50 yards away. The arrow sliced just inches over mother’s back … and hit one of the cubs IN A FOREPAW! The youngster’s screams were shrill and pitiful. What happened next was not pretty. Bob had missed the mark all morning. He first disobeyed Gary, the ranger, by hunting in the closed area. In other words, he let desire lead him to ignore his own ability to choose between right and wrong. Now he missed the mark again by foolishly shooting at the bear, and enraged her further by hitting her cub. No doubt about it … Bob earned the full blown wrath and anger that followed. Now, when an archer botches it on the target range, he might simply decide to pack up, head home, and try it another day. Even if he was in the heat of close competition, in a sudden-death shoot-off, like they say, and missed his mark, he would not suddenly fall down dead, no matter what the name implies! But make no mistake, when his very life is at stake and he misses his mark, he is committed to the full consequences of his error! The same holds true in God’s economy. The creator and judge of all mankind has the right to carry out the sentence He has handed down for those of us who are guilty of deliberately trespassing and breaking HIS laws … missing HIS mark. You see, all of us have this moral guilt before God. It isn’t just that we feel guilty. No, we are truly guilty, whether we feel it or not! And the consequences of this guilt will be as real as the God who judges. Like our bowhunter friend, at that moment of truth it made no difference whether he believed in bears or not. And momma bear didn’t care one bit if Bob promised never to do it again … to do better in the future … or any other feeble excuse. What was done was done. Bob was guilty and he must pay the price. You see, physical death brings separation from the entire physical world. But it is only the doorway into God’s judgment hall. On the other hand, the spiritual death which follows brings separation of the lost soul from God to everlasting punishment. Right about now you’re probably thinking, “Hey! I thought God was supposed to be a God of love. Now you tell me he can be worse than a grizzly bear. What gives?” Well, don’t stomp off just yet. This story isn’t all gloom and doom. The good news is in the next chapter. Come on … pour yourself some more coffee, sit back down and hear me out. Besides, I want to tell you why I think there’s always a little snow left on the high mountain ranges each summer. Many years ago there was a young man, let’s call him Johnny, who lived with his mom and dad on the family ranch east of Kremmling, Colorado, high in the Rocky mountains. He was a normal kid — you know how kids are — but his wild oats began to grow when he was about 15 and by the time John hit eighteen and graduated from high school you couldn’t hold him down. He didn’t see eye to eye with dad about anything (of course, John knew it all) and he had become a wild, Friday-and-Saturday-night drinkin’, fightin’ cowboy. His reputation and life became too much for his parents, so reluctantly they told him he’d have to shape up or ship out. Well, the boy’s pride wouldn’t let him back down. In a heat of anger, John packed up what few things he had and left home. Well, the aspens turned to gold leaf, the peaks took on their first fall dusting of Powdered sugar, the summer jobs ran out in Denver, and the friend he’d been staying with moved back home to Kansas. Thanksgiving was a lonely time, and John knew the last few dollars he had saved wouldn’t hold out much longer. He thought about heading home — you know, hang those mulies and elk in the barn, help dad get ready for winter in the high country, be home for Christmas — but that old pride was still a mountain range in the way. One Wednesday morning John found himself standing outside a storefront in downtown Denver. A large red, white and blue poster had reached through the steamy glass and grabbed hold of him. “Uncle Sam Wants You. Be a Marine. Join today.” He warmed his hands with his breath as he made his decision. That day was December 3, 1941. Johnny took a leg wound going on the beach at Iwo Jima and spent several months in an army hospital in the Philippines before being shipped back to a vet’s hospital in the south. Laying in that bed day after day, he had a lot of time to think about his life. As he read Peggy’s letters over and over he remembered those good growin’-up years back on the ranch. He thought about his horse, Cimerron, and that brought back visions of the pack trips into the high country each fall for elk and deer with Dad. Reading the letters from his folks, John thought how strict they had seemed at times, but he also swallowed the lump in his throat each time he remembered their love. During Johnny’s stay in the hospital, parts of sermons he had heard at the chapel while growing up drifted softly through his mind. He imagined the many times he had heard the old fashioned gospel … how that, “Jesus died in our place so that God the Father could forgive us of our sin.” All of that had seemed like a foreign language to John when he was a kid, back when he didn’t want to hear any of that religion stuff. “… and I’ll be leaving the hospital in a few days. I’ve been thinking about coming home to the mountains. I’ll be riding the train through Denver and I’m told it will be going through Kremmling early Saturday morning. I was not the son I should have been, and I’ve had to swallow a lot of pride. Please forgive me. I have received Jesus as my Savior. Saturday morning, when daylight began to stretch and yawn, John was already awake. He knew they were about twenty minutes from town, and maybe ten minutes from the ranch. He was anxious to see if the white cloth would be there. Now, Johnny knew in his heart that his parents loved him, but he’d been gone a long time, and with only his brief letter of apology to smooth things over. He wasn’t quite sure if the white cloth would be there or not. But what he saw in the crisp morning light that day gave him his answer a thousand times over. As the train came out of the canyon and slowly made it’s way around the last bend along the river, John’s eyes filled with tears. Everyone on the train moved to the left side for a better look. Now, we have a contradiction here. First I told you that God is a God of judgment — a God to be feared. A God who can be like a grizzly bear over our sin. I showed you Bible verses to prove, that because God is holy, He holds you personally responsible to suffer the consequences of your sin. You can’t get away with anything. Then I go and tell you a story to show that God is also a person of great mercy and love and forgiveness. How can He be both? Here’s the answer. A substitute took your punishment for you, in your place. God didn’t say, “Awwwww, let’s just forget it this time.” No, He did not set aside His judgment for sin. Make no mistake, His wrath was poured out to the last drop. But rather than aim His arrows of judgment and death at you and me, He shot them at His own Son! In the substitutionary death of Jesus Christ on the cross of Calvary, God’s holiness and His love shook hands and were satisfied — for any individual who will believe and accept it. Oh, I know we don’t deserve it, but that’s what grace means … getting something we don’t deserve, from someone who wasn’t required to give it. Let me bring this to a point. Remember Bob, our bowhunter friend who got himself into bear trouble? Wonder what ever happened to him? Let’s go back to the valley along the Thoroughfare river and see. Gary Jenson, the ranger, was on the ridge high above the river watching the whole business through binoculars. He saw the bowhunter, he saw the elk, and he saw the bear. Instantly he realized what would happen if Bob kept moving the direction he was headed. He tried to warn the bowhunter by shouting, but with the howling wind and the roar of the river, the ranger couldn’t be heard. He knew there was only one thing left to do, so he took off as fast as he could run. Gary practically broke his neck getting down that hill, splashed across the river like a runaway horse, and crashed through the trees breaking limbs as he ran. Just seconds after the arrow had been released he ran around the boulder and, with absolutely no concern for his own personal safety, he stopped smack-dab, right between the hunter and the mother bear, waving his arms and shouting. And there Gary Jenson stood … and there he died, taking the awful wrath from that she bear — wrath which Bob, the bowhunter, rightfully deserved. That ranger stood as a substitute so the guilty bowman could beat a hasty retreat! And you see, in the same way Jesus Christ died in our place on the cross, taking the full wrath and anger of God’s judgment — punishment which we deserved! Jesus stood in the way and died so that we, too, could run down the pathway of God’s grace and mercy, making a retreat into God’s love. Yes, God does have a bow of judgment and fiery shafts of wrath over our sin — and rightfully so — but his arrows did not pierce through my hands and feet, or yours that day on mount Calvary, nor my side or yours there on the cross almost 2000 years ago. Instead, they drove through the hands and feet and the sinless side of God’s own dear son, the Lord Jesus Christ — for you and for me. Now that’s good news, friend. Think of it this way. Suppose I hand you ten new arrows, each one a masterpiece of the arrowsmith’s art. I instruct you, “Use them, but be careful not to break or damage even one. They are expensive!” Then let’s imagine — and you’d have to imagine real hard in my case — that I went so far as to shoot each one of the arrows dead center into the bull’s eye, demonstrating how it’s to be done. But much to your embarrassment, when you begin to shoot, you not only miss the mark time after time, but the arrows continue to fall far short in the rocks and dirt until they are all either broken, or so badly damaged and bent that they are of no value. You end up with far less than a perfect score, and you owe me for the arrows, to boot! You didn’t win the turkey. All you proved was that you were a pretty bad shot. And that’s exactly the point. God gave the Ten Commandments, not as a difficult way to earn eternal life, like some folks think. Rather, he gave them to show us just how bad we really are, and to demonstrate how perfect we would need to be to EARN eternal life by our own goodness. Why is it impossible for us to earn eternal life by trying to live the Ten Commandments or by merely practicing the Golden Rule? For one thing, it is because we have a flaw in the heart of the tree. We have an old nature inside us that is bound to sin. It has been passed down for generations from our original parents, Adam and Eve. Let me illustrate this point another way. Which came first, the coyote or the howl? A coyote doesn’t become a coyote by howling at the moon. No, he howls at the moon because he is already a coyote by nature. He was born a coyote. In the same way we did not become sinners the first time we sin. No, we were born sinners. Sin is part of our nature. This is the problem God is trying to bring to our attention and has already solved for us, IF we will accept His solution. Here I am, stepping up to target number one, just down the path from the clubhouse. There is a picture of a big buck deer covering the bales. The distance is about 45 yards. (I am determined to shoot a perfect score this time around the course.) I carefully draw the string to my face, aim with all my skill, and release my first arrow. Whack! It flies directly into a large tree to the left of the bales! I stare dumbfounded. I now have an immediate and serious problem. Fact number one — aspen trees have no score on this range. Fact number two — now there is no way for me to shoot a perfect score on this particular round. That possibility is over! Even if I hit the bull’s-eye every single time on each of the remaining targets, (highly unlikely, based on my past performance), I would still end up with less than a perfect score. But the truth is, God has ALREADY added up the score card of our lives, spiritually speaking, and has ALREADY found that every individual life has missed His standard of perfection, therefore deserving his full judgment and punishment. And He has ALREADY poured out that punishment upon a substitute — His Son, the Lord Jesus Christ. You see, Jesus wants to trade you His perfect score card for your imperfect, lousy one with all its sin and failure. “God made him who had no sin, to be sin for us, so that in him we might become the righteousness of God.”26 How does that sound for a trade? “Okay, okay,” you say … “I admit it … I’m lost. So, how do I get out of this spiritual forest and find my way to Heaven?” God’s answer? Just follow the blood trail. If you have ever hunted big game seriously with bow and arrow, you understand that learning to follow a blood trail, no matter how difficult, is a vital part of the hunt. In this little booklet I have tried to make the blood trail very easy to follow. I told you stories to illustrate each point, reasoning with you from the Bible and quoting key verses. Based on the information given, you should be able to find your way out of the forest of sin we human beings have wandered into, and make your way to a lonely hill called Calvary. That is where the blood of Jesus Christ will lead you — to the foot of His cross. In your pride, you can toss this booklet in the campfire and shrug off everything I’ve said. You CAN choose to wander on alone, lost in the forest of life, remembering an old character who gave you a little booklet at his campfire once as you listened to his stories and drank his coffee. The question I asked back at the beginning was: “If you were to die today, do you know for sure you’d go to Heaven?” Now can you see that the final answer to that question is your responsibility? Think of it this way: Suppose you were on an African hunt, and while tramping through the bush, you were bitten by the dreaded Black Mamba snake. Your death is certain! Only a few minutes, max! In the middle of your problem, though, someone tells you of a local doctor who has developed a serum which can save your life. This is your only cure, the only salvation. Now, you can believe that this man is a doctor, and a very good one at that. You can understand the fact that he alone has the only serum. You may even go so far as to sit in his office, read his magazines, talk endlessly to his nurse, and eat the candies in the dish on his counter. You may even promise never, never to tease that snake again. But you will still die from the poison flaming through your system if you refuse to trust yourself into the doctor’s merciful hands and accept the cure only he can give. In the above verses and throughout the New Testament, the word “believe” literally means to “cast yourself upon” … “throw your entire weight upon” … and “completely rest upon and trust yourself to” something or someone, the same way Noah and his family rested in the ark for salvation from God’s flood of judgment upon the world. That is, they did not ride part way and swim part way. They got in the boat for the whole trip! And THAT is EXACTLY what God is offering YOU. A free ride to heaven. Your ticket already paid for by the blood of Jesus. Okay. Do you now recognize that you have missed God’s mark of perfection? Can you see that you deserve whatever punishment God has determined for your sin? Are you now finally able to understand, though, that the Lord Jesus already took every lick of punishment you had coming by shedding His blood and dying on the cross for you, in your place? If you do, then I ask you, please … by simple, child-like faith, trust Him to save you today. Rest in him, accept His free gift of forgiveness and eternal life. We humans have fallen overboard into a vast ocean of sin. It is impossible to swim to shore — our doom is sealed. We are lost for eternity! The angry billows of God’s judgment will surely crash over us as the storm builds. But wait! Miraculously we spot a lifeboat which has broken loose from some far distant port. It drifts up to us, offering safety and salvation from this certain and horrible fate. Of course, this lifeboat is Jesus! How foolish that everyone of us in our self-pride would turn away and reject God’s offer — yes, His command — to cast ourselves into this boat and rest our eternal future on Jesus! Unless God’s Spirit works in our stubborn hearts, opens our understanding and convinces us, we would rather drown! Has God’s Holy Spirit convinced and convicted you today? Then cast yourself on Jesus … spiritually. Claim Him as your Savior and the Lord of your life. He has been out in the forests of life searching for you, even when you didn’t care about Him. Right now, wherever you may be, take Him at His word. Simply ask Him for forgiveness and the gift of eternal life. What He has promised, He will do. Heavenly Father, I’ve not always done everything right in my life. Truth is, I’ve really done a lot of things wrong … some of the time deliberately. Because of that I agree with the Bible that I am a sinner. But now I understand that the Lord Jesus Christ died on the cross in my place to pay for all my sin. Based on this fact, I ask You to forgive me for my sin and to save me today. I accept Your free gift of eternal life, and I receive Jesus as my personal savior and as the Lord of my life. Lord Jesus, please come into my life today. Thank You. Have you received the Lord Jesus as your savior today? If so, please write us at our e-mail address on the back cover of this booklet. And now, I am sure you are asking, “I believe that Jesus died for me. What do I do next?” Of course, the first thing is to tell someone what you have done, like the person who gave you this booklet. Second, begin to talk with your Heavenly Father as you would your closest friend. There is no question too hard for Him to answer, no need too big for Him to provide. Ask Him to walk with you and to lead your life from this day forward. Third, begin to read your Bible, preferably the New Testament at first, and especially the gospel of John. Fourth, find a Bible preaching church where you can meet regularly with other Christians in your new family for worship, Bible study, prayer, and fellowship. Again, ask the person who gave you this booklet to help you. (1 and 2.) Romans 3:23a; (3.) Hebrews 1:3a; (4.) John 1:14 and 18; (5.) Hebrews 4:15; (6.) Romans 3:10-12, 23. (7.) Romans 5:12b; (8.) Romans 6:23a; (9.) Hebrews 9:27; (10.) Revelation 20:14 and 15; (11.) II Thessalonians 1:7-9; (12.) From “Sinners in the Hands of an Angry God” by Jonathan Edwards. (13.) I Corinthians 15:3 and 4; (14.) Romans 5:8; (15.) John 3:16; (16.) Isaiah 53:4-6; (17.) I Peter 2:24a. 18.) James 2:10; (19.) Galatians 2:16; (20.) Galatians 2:21; (21.) Romans 3:27 and 28; (22.) Romans 5:12a; (23.) Isaiah 64:6; (24.) Titus 3:5a; (25.) Ephesians 2:8 and 9; (26.) II Corinthians 5:21. (27.) John 1:12; (28.) John 3:16; (29.) John 3:18; (30.) John 3:36; (31.) John 14:6; (32.) Acts 4:12. Thanks for the Christmas Card! We miss you! Love your sight! Stay in touch!